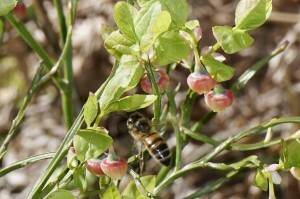 There are good pictures of different stages in the development of the bee and of mite reproduction. There I also find the answer to my question and it’s yes. There are more remains of the bee development than just one piece of whitish/yellowish. The first remain is from the larva when it becomes a pupa and the second is from the pupa when it becomes a fully grown bee. Why this is important is because I have to take in consideration the age of the pupa/bee when I remove it. Do I find “extra” remains even if the pupa has not changed into a fully grown bee (but not hatched), the extra is varroa feces and there is a mite even if I don’t see it. That can happen when the mite doesn’t have progeny. i then don’t have to find the mite to know there is one. I’m checking my, as I think, most promising colonies for the VSH trait. 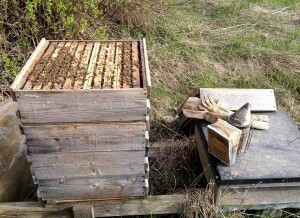 (http://www.elgon.es/diary/?p=146) After dragging out more than 1000 pupae I have learned a lot about analyzing what I see. But I understand it’s more to learn. And I’m becoming faster doing the VSH-test. I have tried a reading lens with a ring lamp + extra 2.5 reading glasses. Together 5 times enlarging. Works great. All pupae leave some white remains at the bottom of the cell. Mites defecate and leaves more white stuff often little higher up on the cellwall. When there’s a whole varroa family you find quite a lot of white stuff, sometimes covering the bottom. A mite without offspring leave most often just a little extra white, sometimes almost nothing (can be hard detecting such a mite, but if missed doesn’t result in too good figures). New white wax comb makes it easier to detect mites without offspring. 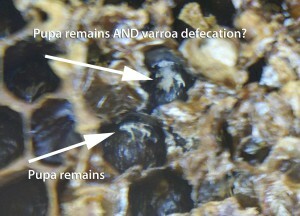 If you find pupa remains AND just above it a small whitish stuff, more compact like varroa defecation, (I know it could be varroa defecation) is that always varroa defecation or could it, in case with an old pupa just about to emerge by itself, be more pupa remains due to the older pupa? 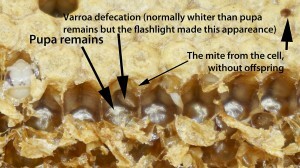 This could be important questions as if it is varroa defecation there is a mite even if I can’t see it. Once I saw a mite popping out from a pupa after it had been laying for a while on the table, a pupa from such a cell. This was seen on a dark comb, where it’s more difficult to detect a single mite without offspring. 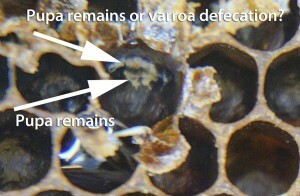 Often such single mites also are not as movable as one in a cell with a whole varroa family. 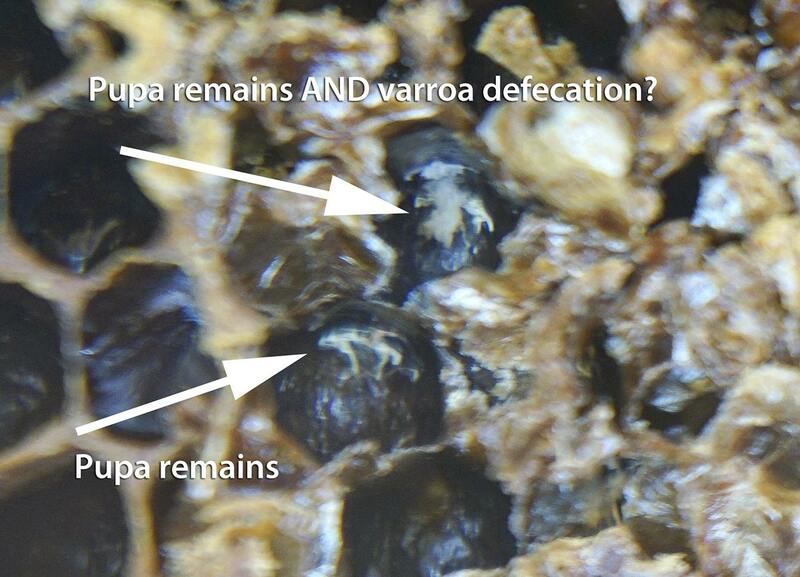 Anyone out there that has detected pupae remains in the cells after dragging them out? 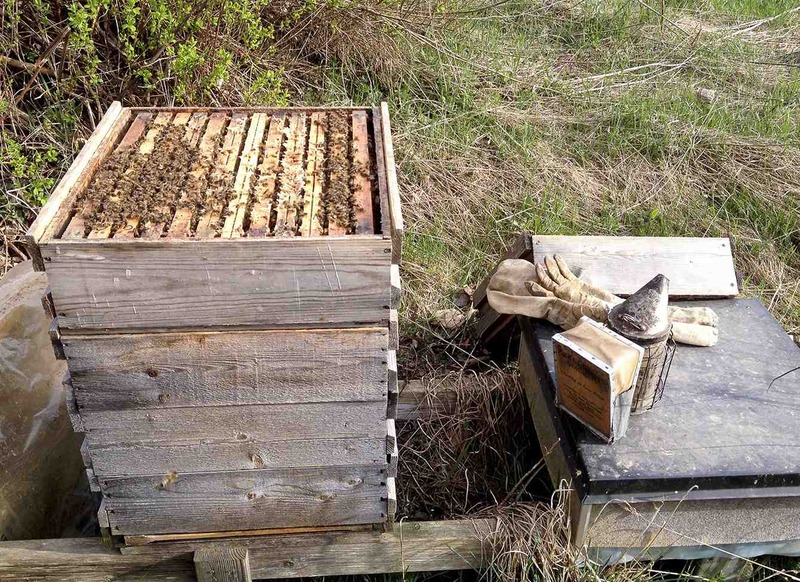 Have you seen the varroa defecation? Differences between them, and compared to pupae remains? It would be interesting to know. 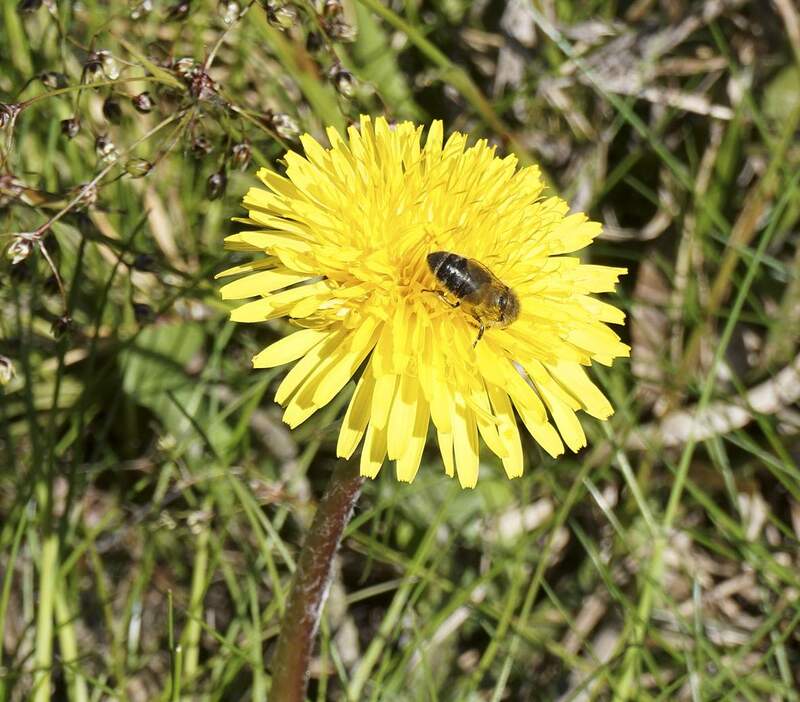 Spring has been chilly, but warms up when sun is shining, it brings out flowers like blueberries and dandelions, some tiny, some beautiful, all giving food and promises of future. 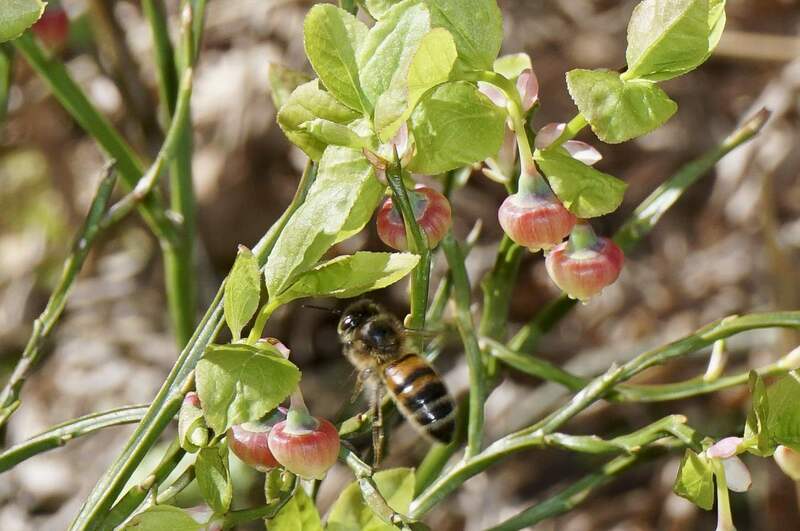 I’m fascinated how tiny the blueberry flowers are in the forest, almost impossible to discern, but bees find their nectar and thus give a good nourishing crop for us. 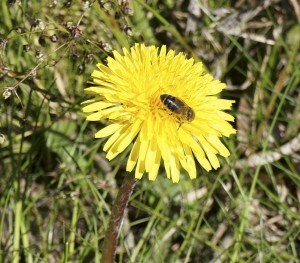 And I’m also curious how beautiful the dandelion flowers are and easy to spot for us, easily found as well by the bees. But how little we appreciate them, inventing special tools to get rid of them, though they are good for our health as well.